1.The Soldering iron kit can meet all your soldering work needs with all fitting included,making your soldering more easy and comfortable. 2.It have a carry box,then it is rather convenient to store small tools and easy to carry. The item is great for electric repair. 2. Imported heating element with large power,rapid heating,you can de-soldering after in for 1 min. 5.The Soldering iron tip compatibility with 900M series. 6. Energy-efficient,power consumption 70% lower than ordinary soldering iron,which is more energy conservation and environment protection. 8. Anti-twist on tail line to further improve safety. 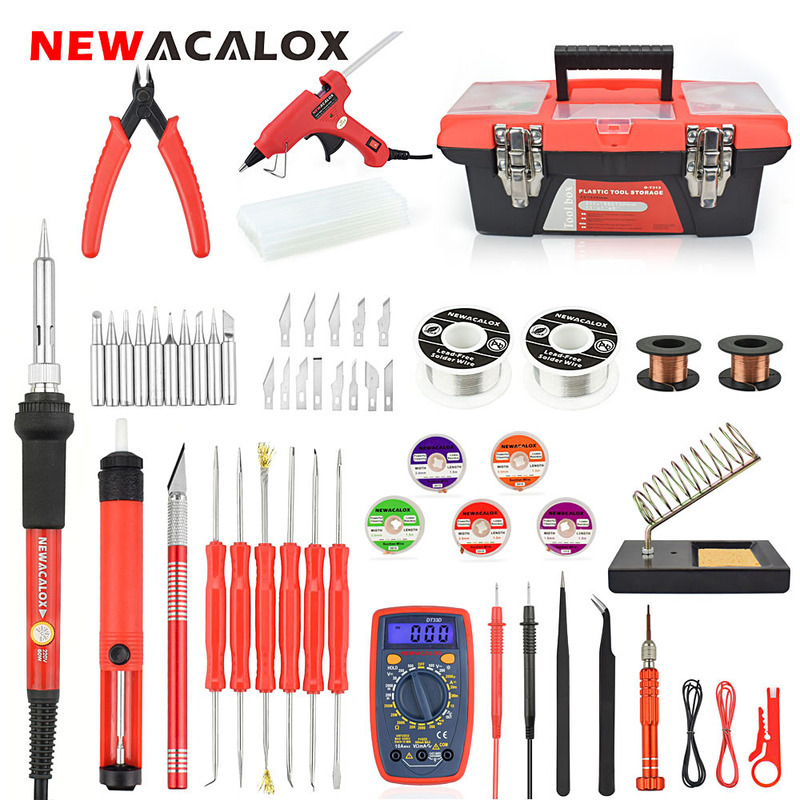 1.Soldering iron:Adjustable temperature controlled: 200-450 ° C (there is a knob wheel on the Electronic Soldering Gun for temperature adjust),there are 5 pcs of different specifications of the soldering Iron tip. 2.Multimeter:multimeter accurately measures current, voltage, resistance, and so on.The LCD screen shows you the data clearly.Displays results quickly with 2-3 readings per second update speed. 3.Glue Gun: Comes with 20pcs hot melt glue sticks, strong adhesive,easy cleaning,Wide application in DIY handcraft and repair job. 4.Suction tin pump and Suction wire:Quick and easy solder residue clearance. 5.Pliers:blade by-pass cutting method, which reduces effort and extends tool life as the cutting blades do not meet edge to edge. 6.Screwdriver set:4 in 1 precision screwdriver to meet your different needs. 7.Soldering iron gun stand:Convenient to hold your soldering iron,compatible with most pencil type soldering irons. 8.Welding Iron Wire:1mm width ,with a low melting point, usually used in iron soldering with bright and full soldering points. 9.Engraving knife:it is ideal for versatile situation,PCB circuit board,Mobile phone film,soft wood,sculpture,paper and so on. 1.When the soldering iron is plugged in for the first time, there comes out a smoke from the tip end. The smoke stops in a smoke while and a smoke never comes out again. 2.After finish the longer life tip face. 3.Use soldering stand and other aids to avoid burnt fingers. Cable Length: 136 cm / 4.46 ft.